From the Gulf Daily News | Traditional pottery experts from Bahrain and Greece showed off their skills during a live exhibition at Al A'ali Shopping Complex from December 2-8, 2010. Costis Chrisogelos, from Thassos, Greece, took part in the live pottery event along with Bahraini potter Majeed Al Shougul. The pair worked together in A'ali for more than a week in preparation for the exhibition, organised by Bahraini publisher Ali Mushaima. 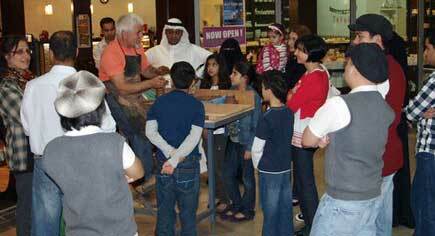 Visitors to the mall could even have bespoke items made on request, as the potters worked against a backdrop of photographs depicting Bahraini potters taken during the 1950s and 1960s.